My tutorial on the May Arts blog is about how to make buttons using embossing powder, Stampendous Color Fragments, and some ribbon. I had had a heck of a time figuring out what to do with the Fragments – though I did see some folks commenting that they had some and love them, so I’m hoping to find more ways to use them from some of you! Here’s the two-part video for you. Enjoy! And I hope to get some superfast sleep tonight and be back in gear tomorrow; last night I woke up at 4:30 (overwhelmed by a wave of my own personal summer!) and never did fall asleep again, so I’m totally wiped! Gnight…or I guess by the time you see this it’ll be gmorning! 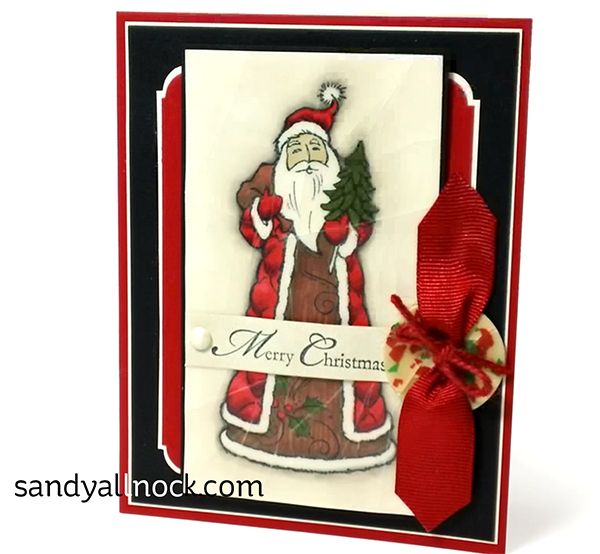 wow, love that santa image, and your coloring is so great. tfs. So glad you took the time to make a coloring tutorial! Really enjoyed it. Thanks so much for sharing your work, we shared this on Pinterest! What a wonderful thing to have your colleagues make during your break-out session. Fabulous! Seems to work fine now – let me know if it keeps goofing up? Not sure what happened to the comment I was writing – but here’s another try. That art project you were worried about (having to lead non-creatives in making a piece of art work) turned out BEAUTIFULLY! The concept made it so easy anybody could participate and skill level just doesn’t matter. Way to go Sandy!